Travel down the Thames in the Summer months and you'll catch sunset before the city lights turn on. We are comparing London Thames River Dinner Cruise Prices from leading ticket suppliers and Try to find you Cheap tickets prices on the market. The gourmet dinner is 5 courses and (subject to menu changes) includes delicious dishes such as smoked mackerel fillets or asparagus and cheddar tart. English lamb rump, roasted duck breast, or pistachio and apricot torte for the vegetarians. The appetizers and mains are followed by salted hazelnut ice-cream, lemon posset or cheese and fruit with fair trade coffee, teas, and infusions with Petit fours served afterwards - Simply scrumptious! Aimed at couples who want a glamorous, romantic evening, children under the age of 12 are not permitted. There is a smart/formal dress code so ensure you have something suitable to wear before booking! Your Experience With London Thames River Dinner Cruise? Dress up to the nines for a romantic evening on the River Thames! Upon boarding at Embankment Pier you will be greeted and welcomed onboard by the professional waiters and waitresses and settled at your table with a drink. With everyone aboard the band will begin to play as the cruise makes its way past Big Ben and the Houses of Parliament. As the boat glides past the South Bank you'll be tucking into the first of your 5 course meal, marvelling at the Tate Modern lit up at night and the London Eye. As the evening continues, with more delicious dishes placed in front of you, you'll pass under the Millennium Bridge, past The Globe, catching a glimpse of St Paul's Cathedral before passing under the illuminated Tower Bridge. If you've finished dinner and marvelled at enough of London's iconic sites you can enjoy after-dinner dancing with a mix of classic and modern hits played by the band. The evening ends at approximately 10.45pm back at Embankment Pier. 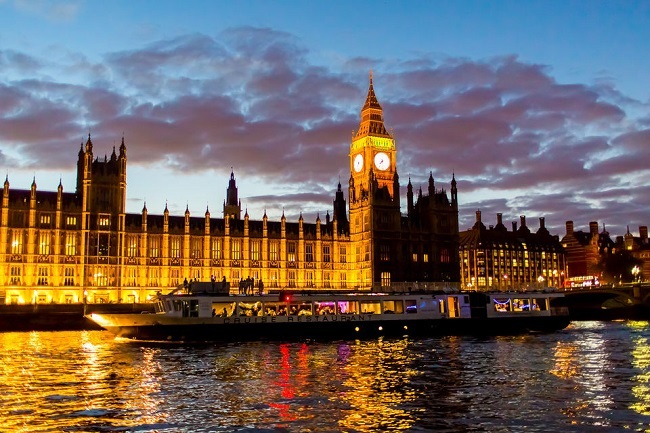 What London Thames River Dinner Cruise Includes? Dress to impress, it's not every night you get to cruise down the River Thames whilst enjoying a gourmet 5 course dinner! Travelers Reviews about London Thames River Dinner Cruise? Travellers talking about this cruise on Trip Advisor, Viator, and Get Your Guide generally give it high ratings and very good feedback though for some few passengers expectations did not live up to what they received. One happy passenger said "I had a lovely time on a lovely vessel with lovely staff and beautiful live music. It was a great experience." Someone else said "Outstanding dinner with attentive service being serenaded by a live band." Another happy customer said "The dining experience has to be the most enjoyable you could imagine on board a floating / travelling restaurant." Some people noted that they were too hot seated inside during the warmest Summer months but generally, people had a wonderful evening saying that the food was excellent, the service professional, and that they would recommend this dinner cruise to others. Check the dress code - Trainers, flip-flops, shorts and leisurewear are not permitted. A jacket, a tie and a pair of trousers or smart dark denim jeans are allowed (so long as the jeans do not have holes/tears). Ladies can wear smart cocktail dresses or trousers.